Mickael Tanter’s group at Langevin Institute demonstrated a new way to perform deep functional brain imaging based on ultrafast Ultrasound imaging. This concept of ultrafast imaging based on plane wave transmissions is the core of fUltrasound imaging. Follow the news about the The FUSIMAGINE project on their website. Our vasculature is like a tree, we have big arteries (aorta), then smaller branches (carotid), then smaller, and so on. Conventional ultrasound imaging sees the big vessels. whereas the very small vessels remain invisible. With ultrafast imaging we suddenly obtained incredible images of the brain flow with a sensitivity multiplied by almost 100. We can now see much smaller vessels. Essentially NVC is what allows the brain to work and function. This coupling controls the blood flow to the brain and gives the neurons the energy to send and receive messages. Without these nutrients and oxygen regulated by NVC the brain would not work properly. Why is NeuroVascular Coupling Important? When NeuroVascular Coupling in the brain is damaged, it can be very hard to re-establish this coupling. We call this NeuroVascular Coupling dysfunction, which means that the connection between the blood flow and the neurons has changed and is not working very well, or as well as it used to before the injury. After a head injury or a concussion, it is very typical that this coupling is not working correctly, which can result in many of the typical concussion symptoms. Functional imaging modalities such as fMRI or optical imaging identify regions of brain activity by measuring changes in blood flow thanks to the neurovascular coupling. Paradoxically, Ultrasound was not present in the field of Neuroscience till recently, whereas it is the most used modality for blood flow imaging in clinics. The reason for this was the poor sensitivity of Doppler ultrasound limiting blood flow imaging to large arteries. Ultrafast Doppler imaging based on plane wave imaging breaks this barrier and enabled recently the emergence of fUltrasound (by analogy to fMRI). fUltrasound (fUS) is able to provide unique whole brain images of perfusion on small rodents with unprecedented resolutions (100 µm and 10 ms). Functional imaging of cerebral blood volume during epileptic seizures, whisker or odor stimulations, drug injection emphasizes the potential of this new imaging modality to provide completely new information for the understanding of brain. As fUltrasound relies on ultrafast ultrasound acquisitions, it also enables the whole brain mapping of vascular indexes (such as resistivity, pulsatility or transient systolic time indexes) within a single cardiac cycle in addition to functional imaging of brain activity on longer time scales. Figure 1. The main applications and features of functional ultrasound (fUS) imaging. fUS imaging provides (i) a compatibility with a wide range of animal models for preclinical studies, (ii) the ability to image awake and freely moving animals, (iii) possibility to combine with super-resolution ultrasound localization microscopy, (iv) possible extension to 3D imaging, (v) functional connectivity mapping for brain connectomics, (vi) translation to clinical neuroimaging in human neonates or (vii) peroperative neuroimaging during brain surgery and (viii) EEG compatibility for EEG-fUS recordings. A quick history of the MRI. 1882 - Nikola Tesla discovered the Rotating Magnetic Field in Budapest, Hungary. This was a fundamental discovery in physics. 1937 - Columbia University Professor Isidor I. Rabi observed the quantum phenomenon dubbed nuclear magnetic resonance (NMR). He recognized that the atomic nuclei show their presence by absorbing or emitting radio waves when exposed to a sufficiently strong magnetic field. 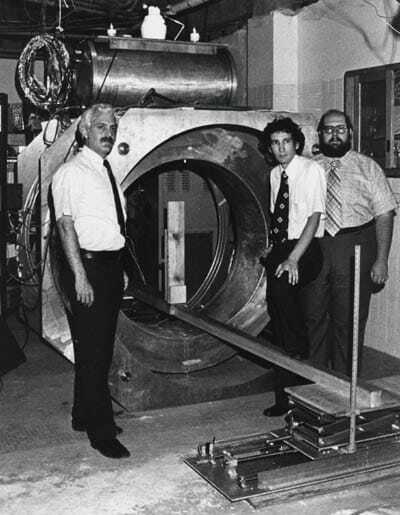 L to R: Raymond Damadian, Larry Minkoff and Michael Goldsmith with "Indomitable" and its iced liquid helium and liquid nitrogen ports: the world's first supercooled, superconducting MR scanner and the world's first MRI machine. 1946 - Felix Bloch and Edward Purcell discover magnetic resonance phenomenon. 1971 - Raymond Damadian, an American physician and experimenter discovered that hydrogen signal in cancerous tissue is different from that of healthy tissue because tumors contain more water. More water means more hydrogen atoms. When the NMR machine was switched off, the bath of radio waves from cancerous tissue will linger longer then those from the healthy tissue. 1972 - Raymond Damadian applies for a patent, which describes the concept of NMR being used for above purpose. 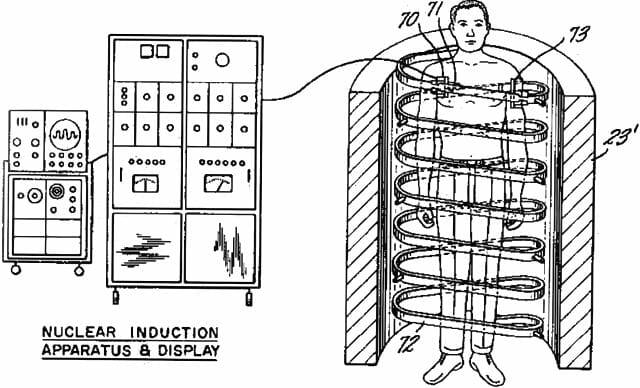 He illustrates major parts of MRI machine in his patent application. 1977/1978 - Raymond Damadian went on to build the first MRI scanner by hand, assisted by his two post-doctoral students, Michael Goldsmith and Larry Minkoff at New York’s Downstate Medical Center and achieved the first MRI scan of a healthy human body in 1977 and a human body with cancer in 1978. 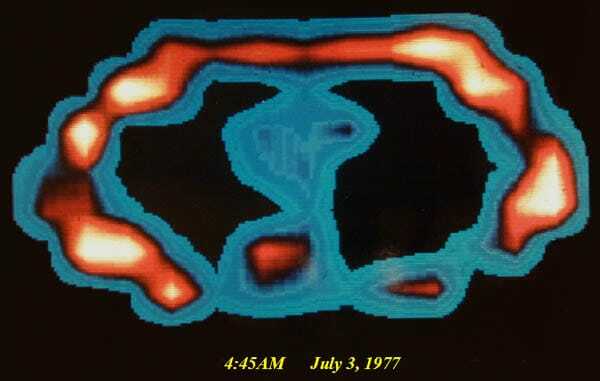 The first ever MRI scan of a live human being (4:45 AM July 3, 1977). 1987 - Real time MR imaging of the heart is developed. 1993 - Functional MR imaging of the brain is introduced. 2000's - Cardiac MRI, Body MRI, fetal imaging, functional MR imaging are further developed and become routine in many imaging centers. Research centers make significant strides forward in imaging cartilage on high field scanners. The number of free standing MRI centers, most of which utilize low or moderate field MR scanners significantly increases. A cortical homunculus is a distorted representation of the human body, based on a neurological "map" of the areas and proportions of the brain dedicated to processing motor functions, or sensory functions, for different parts of the body. 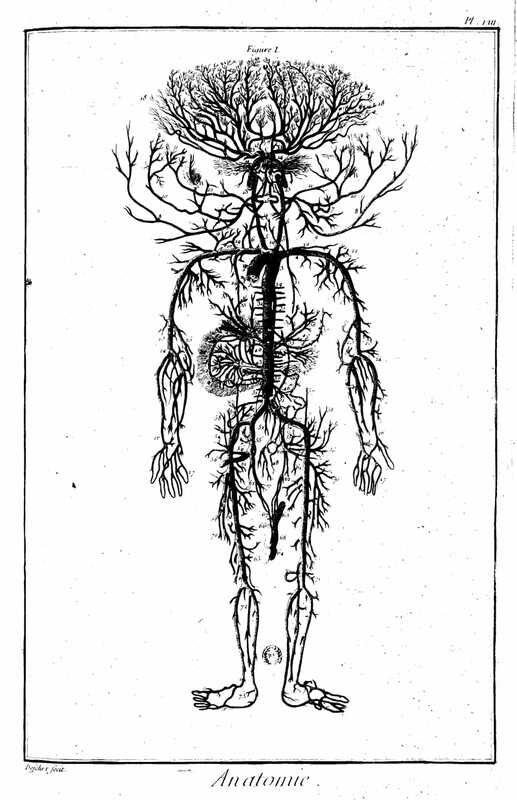 Homunculus is Latin for "little man", and was a term used in alchemy and folklore prior to the concept being utilized in scientific literature. A cortical homunculus, or "cortex man", illustrates the concept of a representation of the body lying within the brain. Fibres from the spinal cord are distributed in various parts of the parietal lobe in cerebral cortex this form a representational map of the body which is called homunculus. 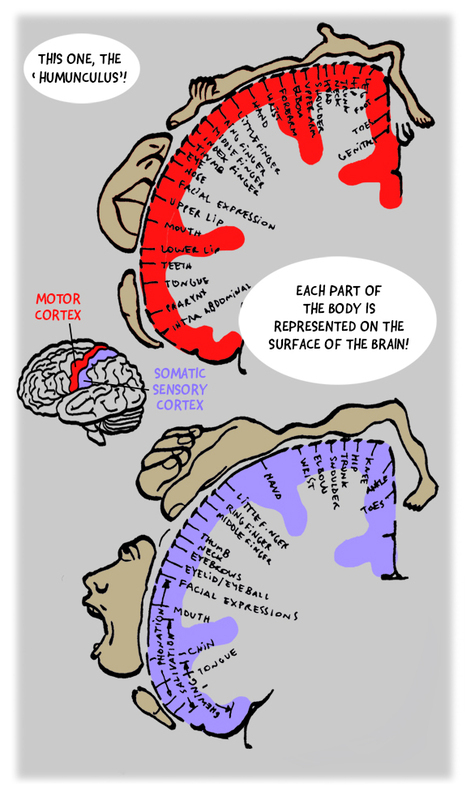 A motor homunculus represents a map of brain areas dedicated to motor processing for different anatomical divisions of the body. The primary motor cortex is located in the precentral gyrus, and handles signals coming from the premotor area of the frontal lobes. A sensory homunculus represents a map of brain areas dedicated to sensory processing for different anatomical divisions of the body. The primary sensory cortex is located in the postcentral gyrus, and handles signals coming from the thalamus. Dr. Wilder Penfield and his co-investigators Edwin Boldrey and Theodore Rasmussen are considered to be the originators of the sensory and motor homunculi. They were not the first scientists to attempt to objectify human brain function by means of a homunculus. 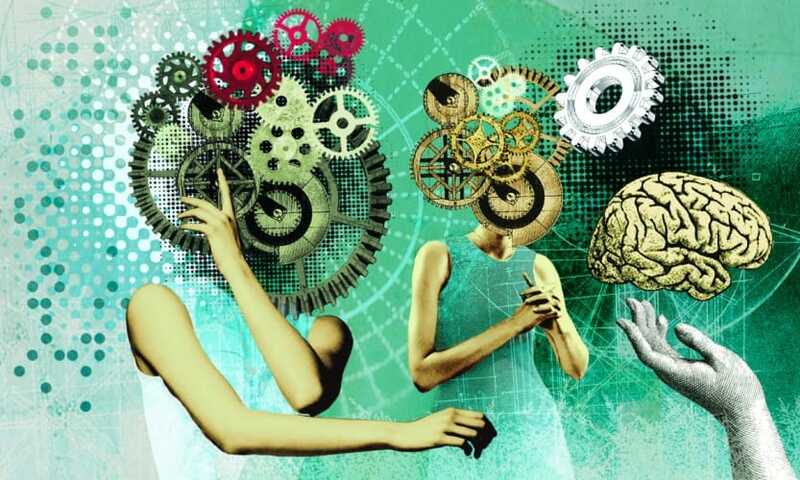 However, they were the first to differentiate between sensory and motor function and to map the two across the brain separately, resulting in two different homunculi. In addition, their drawings and later drawings derived from theirs became perhaps the most famous conceptual maps in modern neuroscience because they compellingly illustrated the data at a single glance. Penfield first conceived of his homunculi as a thought experiment, and went so far as to envision an imaginary world in which the homunculi lived, which he referred to as "if". He and his colleagues went on to experiment with electrical stimulation of different brain areas of patients undergoing open brain surgery to control epilepsy, and were thus able to produce the topographical brain maps and their corresponding homunculi. More recent studies have improved this understanding of somatotopic arrangement using techniques such as functional magnetic resonance imaging (fMRI). An Epileptic seizure occurs when a burst of electrical impulses in the brain escape their normal limits. They spread to neighboring areas and create an uncontrolled storm of electrical activity. The electrical impulses can be transmitted to the muscles, causing twitches or convulsions. 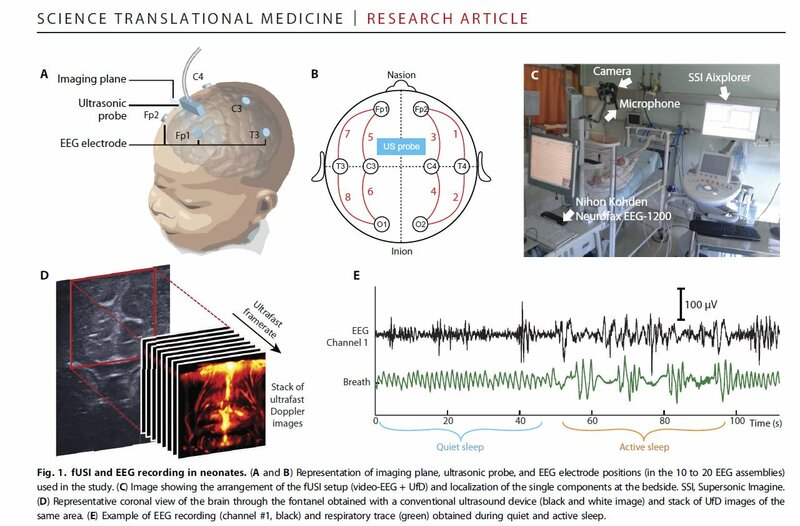 Read this article about «a portable tiny brain scanner for studying brain disorders in infants». 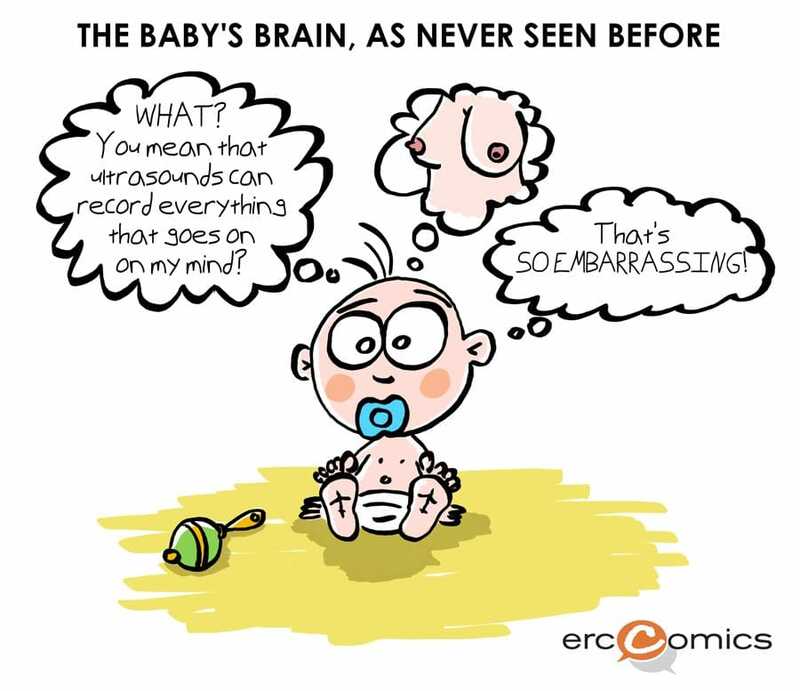 A video showing how functional ultrasound imaging (fUSimagine) catches the brain activity of a newborn baby. Watch «L’etincelle» a tv program by France 3 with Mickael Tanter (in french). For the first time ever, a team of scientists and clinicians led by the EU-funded researcher Mickael Tanter has managed to record the brain activity of a premature new-born baby during resting and during an epileptic seizure. Read an interview (in French) to Mickael Tanter and Clayton Junior about their collaboration on our webcomic Brain Trippers. The goal of the ERC Advanced Grant FUSIMAGINE is to introduce a breakthrough full fledged neuroimaging modality based on ultrasound. 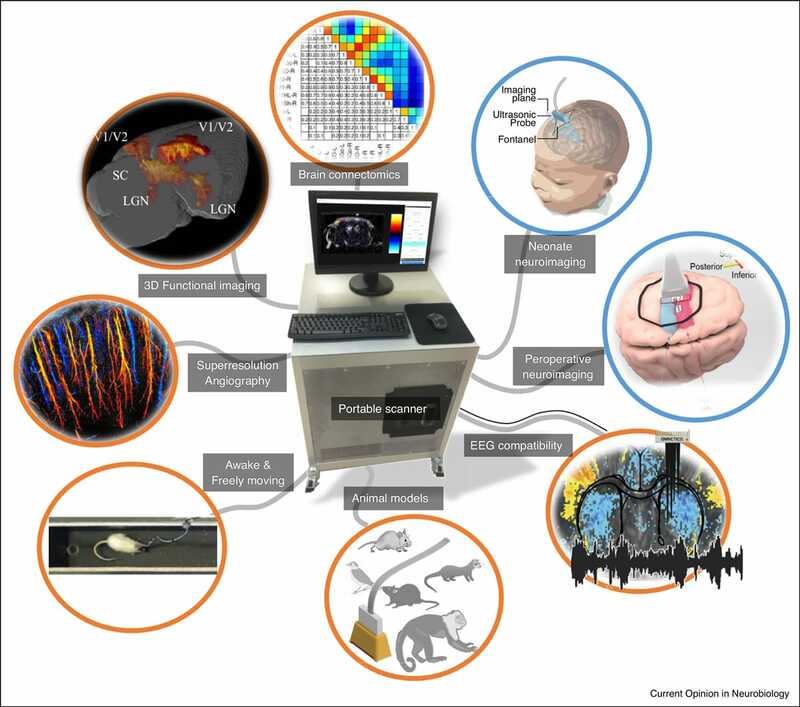 Thanks to the 2.5 M€ funding from ERC, the Fusimagine team at Langevin Institute will provide evidence that functional Ultrasound imaging of brain activity (fUltrasound by analogy to fMRI) could have a major impact in neuroscience from fundamental research to clinical applications. For a full lecture by Mickaël Tanter about High-Speed Ultrasound Imaging visit this page.